I’m loving the rain! I’ve been waiting for rain to come and soften up the dirt in my backyard so I can finally do some much needed yard work. The weeds are almost taller than the 6-ft fence in the backyard. It’s pretty bad. A couple months ago, I tried to pull some of the weeds, but the dirt was so hard, I ended up breaking two hoes before quitting. I haven’t been back out there since. I am looking forward to going back outside to do some yard work and get a nice workout. Anyway, since it’s raining and a bit cold outside, I cooked some Cháo Gà to keep warm. 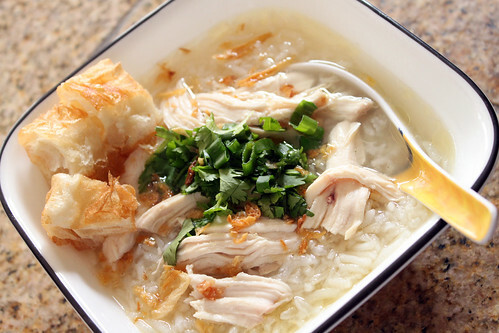 Cháo Gà is Vietnamese Chicken Porridge, or Arroz Caldo for all the Filipinos out there. 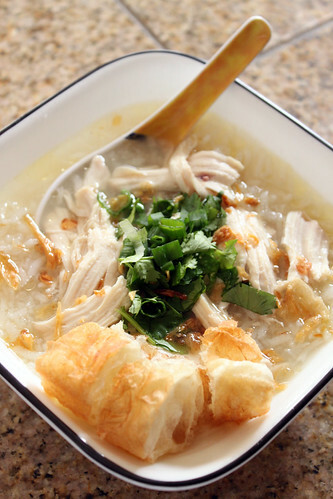 Cháo Gà is comfort food to me, often made when it’s cold outside or when someone in the family is sick. I also see it served all the time at parties. When I eat Cháo Gà, I put tons of pepper in it. It reminds me of my trip back to Vietnam in the Summer of 2006. All the Cháo bowls I ate in Vietnam were super spicy and loaded with crushed Phu Quoc black pepper (One of the best pepper in the world, IMO). I also like to soak Chinese Doughnuts in my Cháo Gà. I think the Chinese Doughnut enhances the flavor and the fried buttery goodness is super yumm. Since there are a lot of picky eaters in my house, I separate all the toppings and let people add whatever they like to the Cháo Gà themselves. When I make Cháo Gà, I only shred the chicken breast and thighs. I leave the drumsticks and the wings whole, so anyone who wants to eat the skin will be able to eat it. Fill up a stockpot with 12 cups of water, 2 cups of chicken broth. Add onion, ginger, fish sauce, sugar, and salt and bring to a boil. 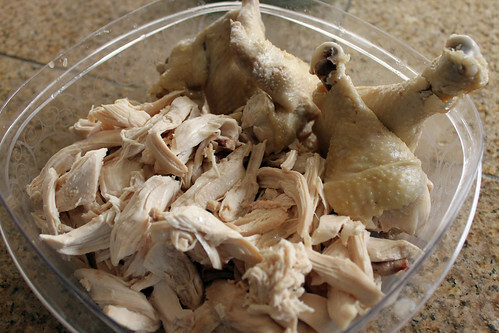 Clean whole chicken, remove goodies from the inside and trim off excess fat. When liquid boils, add chicken and let boil for about 5-7 minutes. Put lid on stockpot, turn off the heat, and allow chicken to hangout in the broth for 45-50 minutes. Chop Cilantro and scallions and set aside. Slice garlic to thin slices and set aside. Heat skillet on Medium Low and fry rice until lightly browned and fragrant. 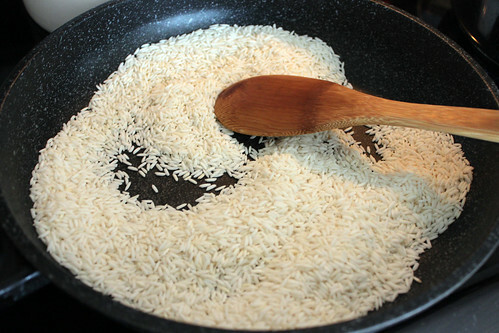 Once rice is lightly browned, add sliced garlic and stir around. After 45 minutes, remove chicken from the stockpot and put in the freezer for about 15 minutes. After 15 minutes, shred chicken and set aside. Remove ginger and onion. Add additional salt or fish sauce if desired. Bring broth back to a boil and add rice. Allow rice to simmer for about 25 minutes. Pour cháo into serving bowl, add shredded chicken, scallions, cilantro, fried shallots, and pepper and serve immediately.